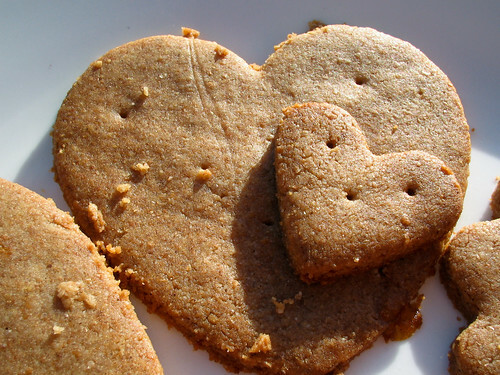 Almost two weeks ago I made these graham crackers. I used this recipe, adding some extra honey and cinnamon. 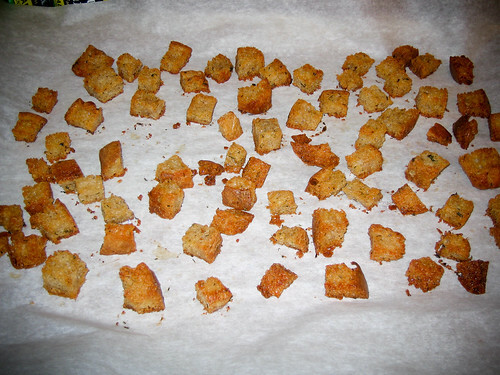 I rolled the dough out in parchment paper and cut out the shapes on the baking sheet, pulling the scraps away afterward. They were no harder than cookies and came out great! 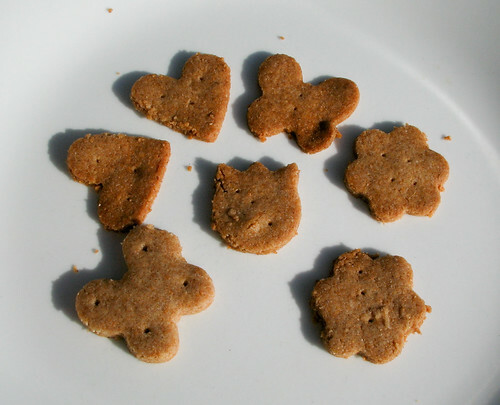 This entry was posted in Home, Kitchen and tagged baking, graham crackers on June 27, 2010 by Shannon. 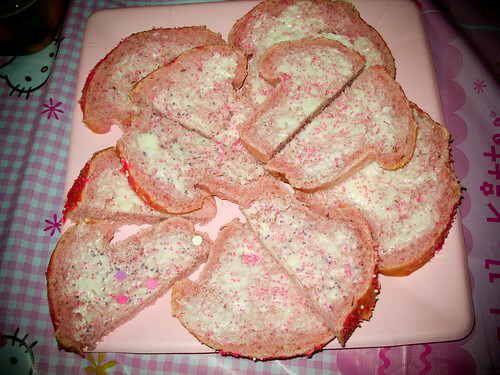 I just learned about fairy bread. Apparently it’s an Australian favorite for kids’ parties. 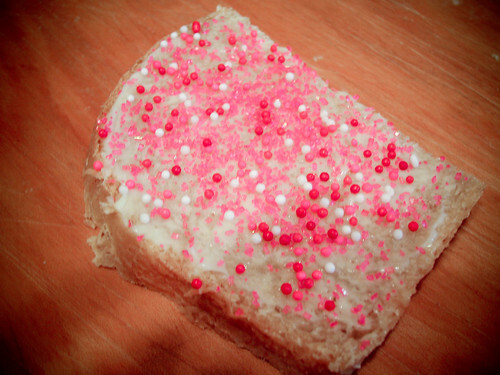 Fairy bread is just buttered bread with sprinkles on top. Ever since I found out about it and started looking at pictures of it on flickr and whatnot, I’ve been thinking about how I would make it. My cousin is turning two next month, and it sounded like a great thing to bring for her party, especially with my fresh baked bread. 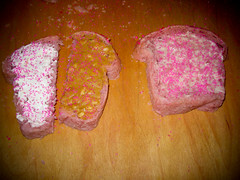 Yesterday I had to see how it actually tasted, so I cut half a slice of bread, buttered it and put on some pink sugar and valentine colored non-pareils. It was actually pretty good, but I think it would be better with a little different bread. 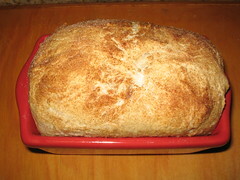 My loaf was the second of a batch of dough, so it had gotten a little sourdough flavor. Now I’m thinking about coloring my bread dough. Is that crazy? 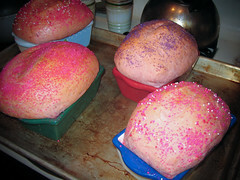 This entry was posted in Home, Kitchen and tagged baking, bread, cooking, fairy bread on April 20, 2010 by Shannon. 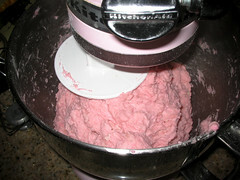 Friday, April 16 – I made two batches of dough! First I made a batch of Light Whole Wheat bread with 2 cups of white whole wheat flour instead of 1 cup of whole wheat flour. Then I made a batch of olive oil dough. Saturday, April 17 – We made calzones for lunch with olive oil dough. 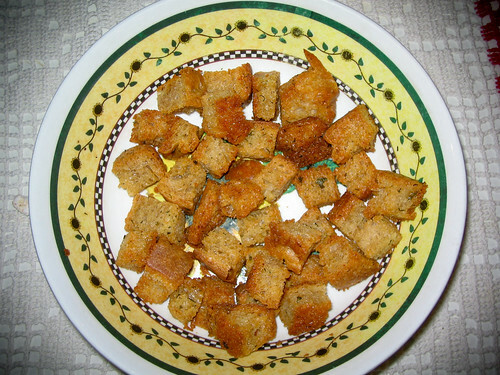 I brushed them with olive oil and sprinkled on garlic salt and parmesan before baking. They turned out huge so we cut them in half. They were really good though. 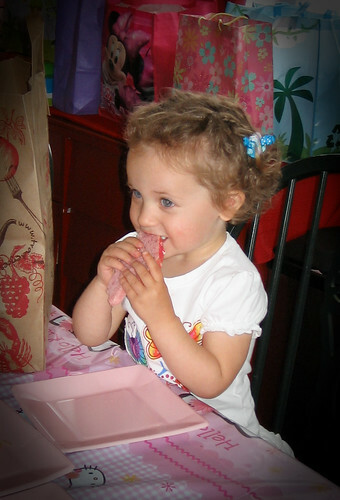 Sunday, April 18 – Today we had a second late Easter party since so many people couldn’t make it on Easter. 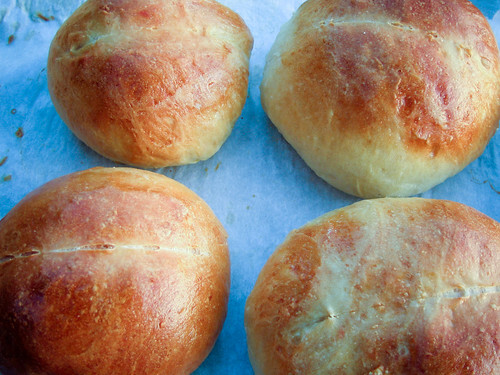 I made a batch of rolls, half with light whole wheat dough, half with olive oil dough. I brushed them with butter and baked in muffin tins. Also, I learned about fairy bread today. 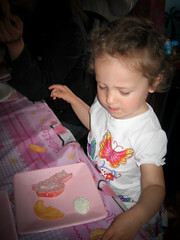 Apparently it’s an Australian staple at kids’ parties and it’s just buttered bread with sprinkles on top! It looks so cute and simple. My little cousin is turning two next month and I’m already scheming about making it to bring for her birthday. 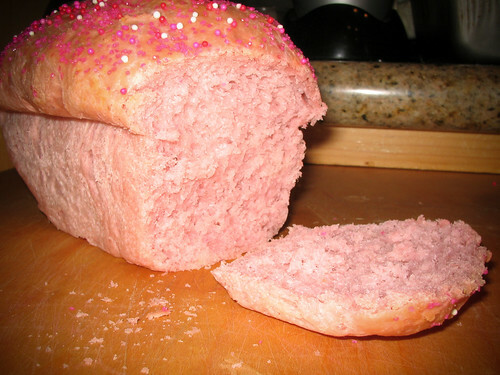 I was trying to think of different things I could do to make it cool, and then I thought… colored bread! 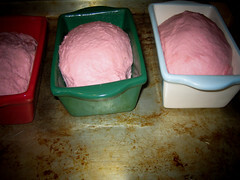 I could tint my bread dough pink or purple. 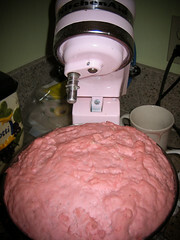 Now I just want to make my next batch of dough pink. Is that crazy? 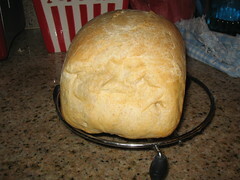 This entry was posted in Home, Kitchen and tagged baking, bread, cooking on April 18, 2010 by Shannon. 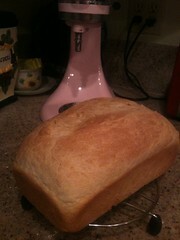 Yesterday, I baked the rest of my Soft American-Style White Bread dough. I really wanted to try some cinnamon bread with this dough, so I made a mini loaf. Here’s some advice: wax paper is not at all parchment paper and if you are out of parchment paper, do not try to substitute wax paper. The rolling out and rolling up the cinnamon in the dough didn’t work quite as neatly as I’d hoped, I probably should have rolled it out with more flour. 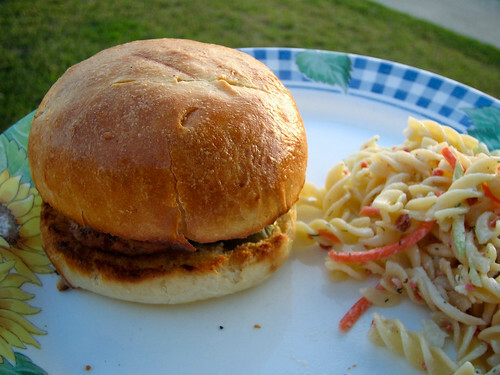 It looked a bit funny when I put it in the pan, but it came out looking nice, and it sure tasted good! I brushed it with butter instead of an egg wash. The instructions said to brush the top with sugar, but I used some of my leftover cinnamon and sugar. 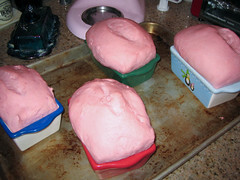 For the rest of the dough, I put it in my usual loaf pan that I use for sandwich bread. I had a revelation the other day about the last loaf and the end of my batch of dough. There usually isn’t as much dough for the last loaf of bread as for the first. As a result, I often end up with really short loaf of bread or I use the smaller loaf pan and the sandwiches are really tiny. 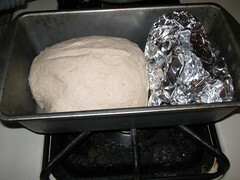 Finally I thought, “What if I put a ball of aluminum foil in the end of the loaf pan?” Why didn’t I think of that before? It worked pretty well and I ended up with sort of a partial loaf which, when sliced, should be the normal shape and size for sandwich bread. One end looks a little lumpy, but I think it came out pretty nicely. 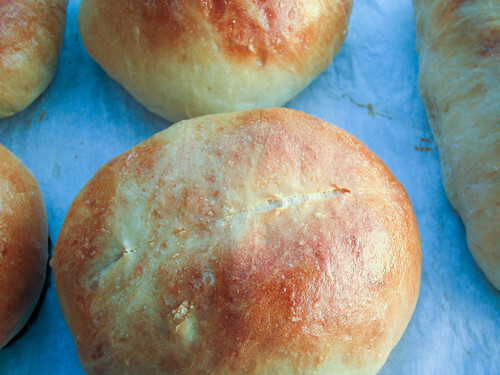 A great bread hack! Also this morning Papa was at Henry’s Market and called to see what kind of flour I needed. I suggested looking for King Arthur’s wheat flour. They came back with King Arthur 100% Organic White Whole Wheat Flour. It’s an interesting flour, but I’m not sure if it will taste more like white flour or more like wheat flour, so I’m not sure how I’ll use it yet. 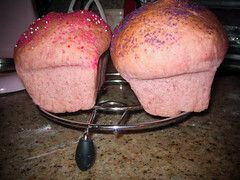 This entry was posted in Home, Kitchen and tagged baking, bread, cooking, Home on April 16, 2010 by Shannon. 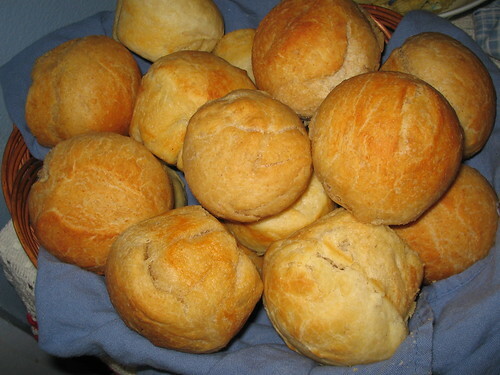 April 8 – Made The Master Recipe/Boule dough with one cup wheat flour. Turns out this is also the Light Whole Wheat bread in the book! This was my first homemade bread in a while and it was super tasty, although it didn’t get as tall as I wanted in the loaf pan. 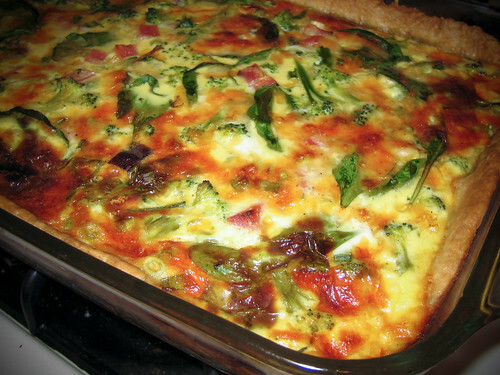 I think this was because I slashed it after its 40 minute rest right before putting it in the oven which made it unrise. From now on I’m going to slash before it rests. This bread was amazing for toast and good for sandwiches, but the second loaf’s crust was a little hard. 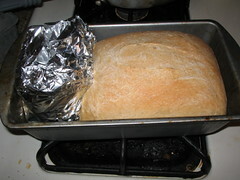 April 11 – Made Soft American-Style White Bread, substituting one cup of wheat flour for one of the cups of all-purpose. I probably would have tried it with a little more wheat flour, but that was the end of my wheat flour. 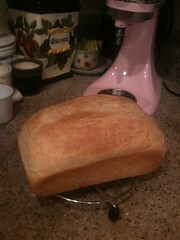 This bread smelled amazing, though I think that had something to do with the fact that it was brushed with butter! My loaf came out looking really nice and sliced up beautifully for sandwiches. It was softer than the Master Recipe, which is why I wanted to try it. 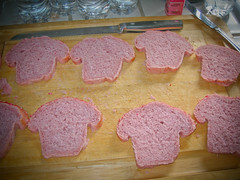 A great sandwich bread, especially the texture, but it was a little plain tasting. 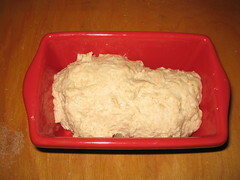 I think I’d like to try making a mini cinnamon loaf with this dough, and I think it would make nice rolls. 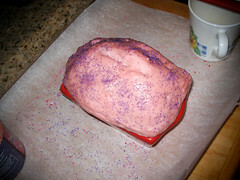 This entry was posted in Home, Kitchen and tagged baking, bread, cooking, Home on April 12, 2010 by Shannon. About a year ago while we were still in our apartment, I started making my own bread for our sandwiches. We were now both working at home all day and needed satisfying lunches every day, and we were trying to save money however we could. I stumbled upon Artisan Bread in 5 Minutes A Day. I tried the free “master recipe” provided on the website, and it came out great. I continued to make the bread regularly, enough for sandwich lunches almost every weekday until we moved in with my grandparents. I made a couple batches of bread while there, but then I sort of stopped for a while. Last week I made my first new batch of dough in a while. It was just as easy and good as I remembered. I wanted to try different bread, though. Last night I finally bought the whole book. I got the Kindle version mostly with my swagbucks-earned Amazon gift cards. This evening, with the little end of my previous loaf not enough for sandwiches tomorrow, I started a batch of dough with a new recipe from the book. The bread is sitting out and cooling right now, and it is beautiful. It looks and smells amazing. 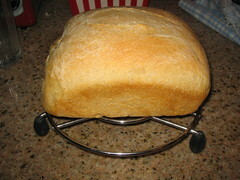 I used the Soft American-Style White Bread recipe, although I incorporated some wheat flour with the all-purpose. They’ve all tasted great, but this is one of those loaves that just looks like a “proper” sandwich bread. I can’t wait to cut into it tomorrow!